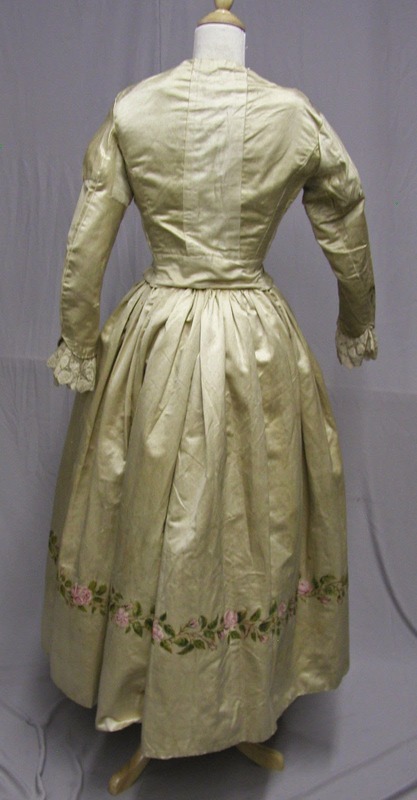 1236, 1880's Painted Silk Fancy Dress Ballgown: This two piece ensemble was created originally in the 1880's and has seen many alterations over the years. This is what they call "fancy dress." Costumes made for masquerade balls which were very popular in the 19th century. 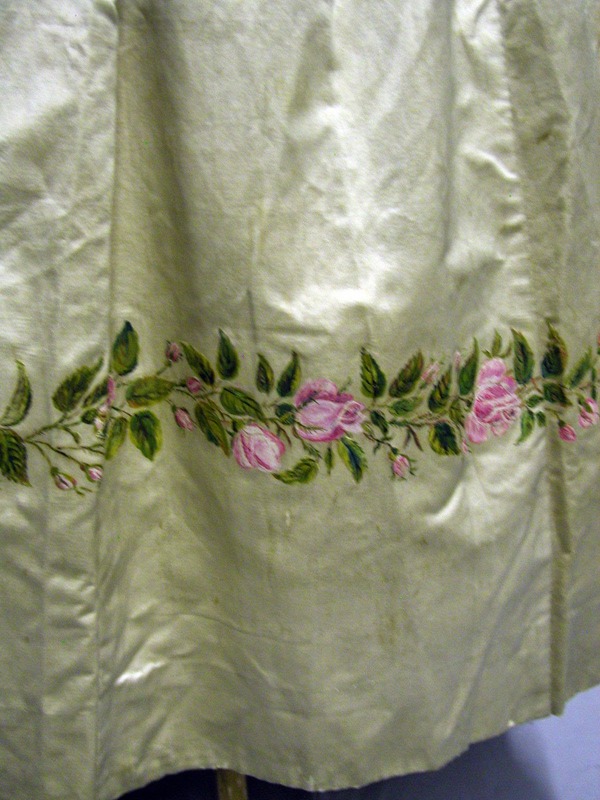 It is made of ivory silk with pink roses hand painted on it. 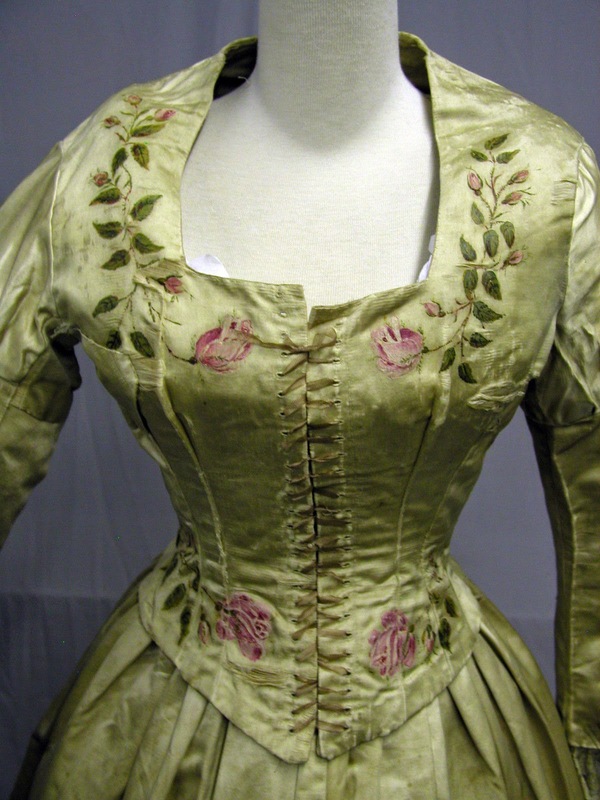 The bodice currently has a bust of 38, a waist of 28 and shoulders of 16 inches. The skirt has a waist of 34 and a length of 34 inches. This was once an incredible gown but it has been altered and patched and worn many times. 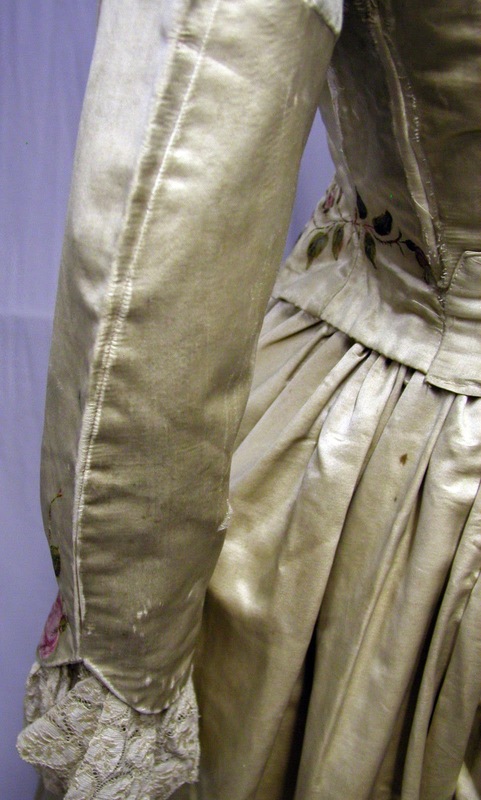 The lining of the bodice is still sound but has stains. 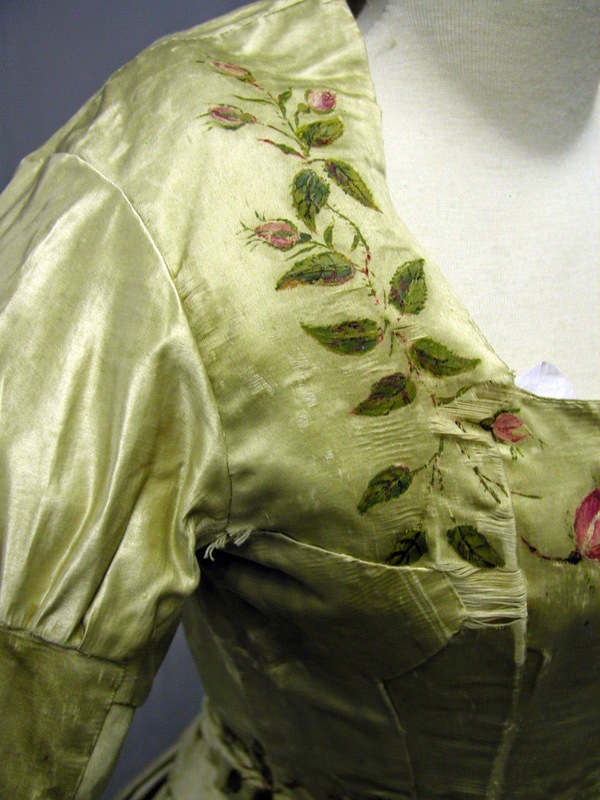 The bodice itself has shredding on the shoulders and back. There are wears to the creases in the sleeves. The silk ribbon lacing is very fragile. 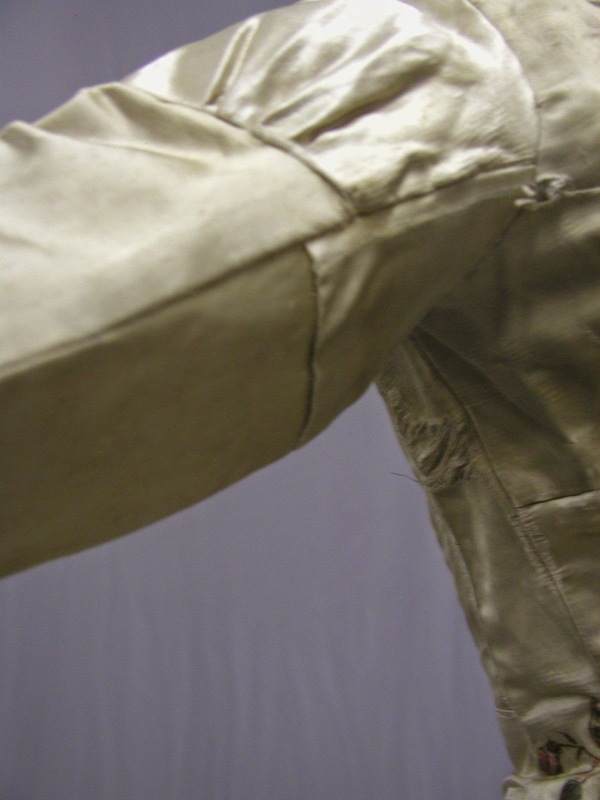 The under arms have been patched and there is much wear throughout the whole garment. The back has been enlarged and length added. There is age related spots and pitting all over both the skirt and blouse. The skirt has had the waist band enlarged. It still managed to display well from the front. It is a great piece of American history. I would have loved to know what this gown first was. My guess is a Romantic era gown but it might be older than that. 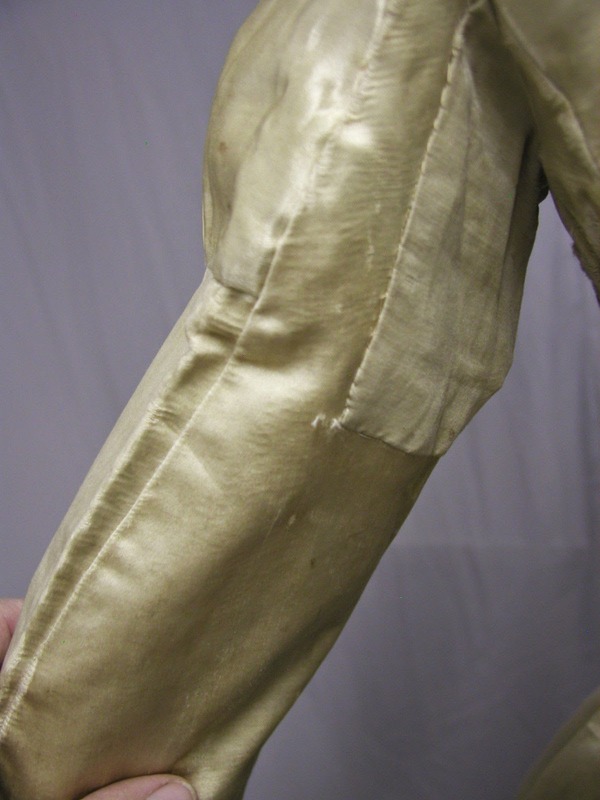 I think the last time it was cut up was around 1891 based on the shape of the Frankenstein sleeves. Notice how they are cut to be fitted around the arm but puffy at the shoulder. 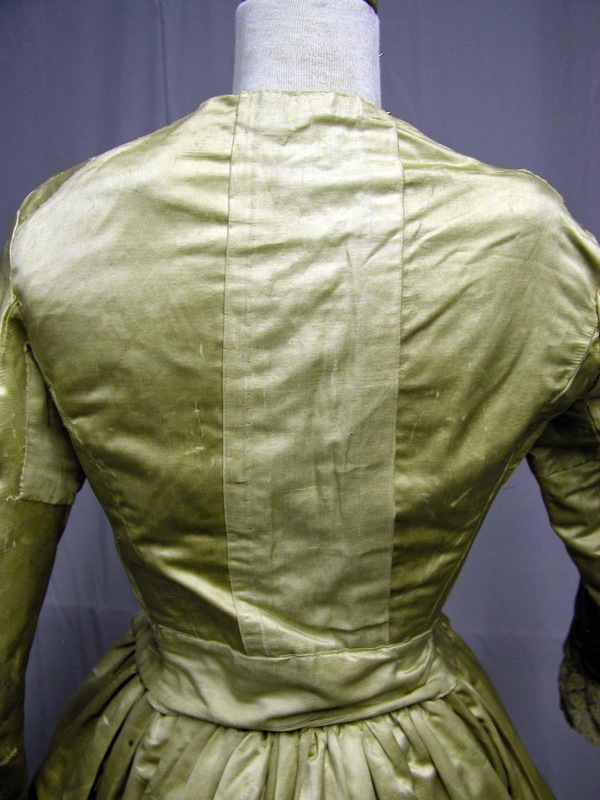 The patches in the back indicate a much earlier date to the dress - again, probably 1830's. It's hard to tell though with all the work that has been done to it. This would have been worn with a dickey like neck piece that is obviously lost. I wouldn't be surprised if this was a wedding gown passed down and re done for each generation. For the next few posts, I hope to add some truly spectacular items to the blog. Congratulations on such a milestone post! 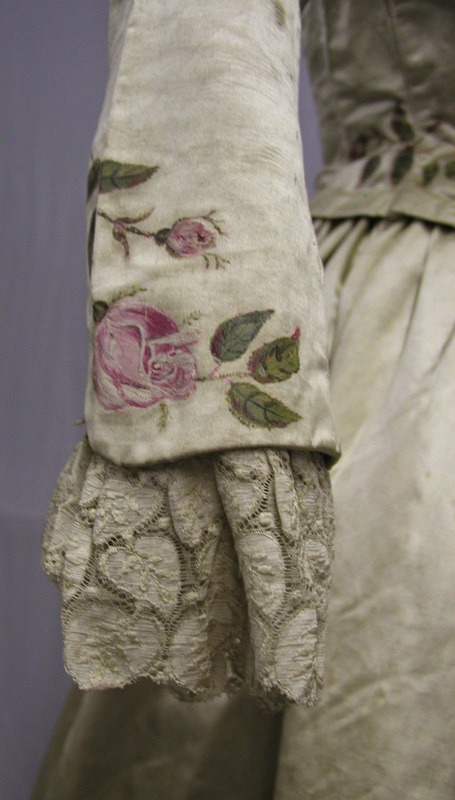 From your presentations, I am starting to learn something about old clothing and textiles, but mostly I love your eye, your scholarship, and your enthusiasm.